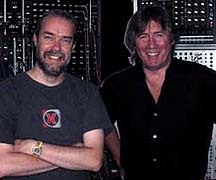 Ian Boddy and Mark Shreeve have been making music together as the duo Arc since 1998 when their first studio CD Octane came about. This collaboration has since proven to be one of the most interesting match-ups in contemporary electronic music. Church (74'30") is their sixth release, their forth live album and presents a recording of their fantastic performance as part of The Gatherings Concert Series in Philadelphia from 14 November 2009. The title Church is obviously in recognition of this concert's renowned venue (the sanctuary of St. Mary's Hamilton Village) and exceeds all expectations of the genre of live Spacemusic events and the resulting albums. The music begins with a hushed windblown nightscape punctuated by the premonitory tolling of a bell in the distance. Drama builds further as the slow march of deep bass and drums pound beneath what may be the most macabre (and ear catching) synth anthem ever devised. As the eerie opening runs its chilling course, reverberating down to a cool calm, the energy of this piece runs off in a different direction as sequencer patterns cycle out into space with their ascending lead melodies trailing after. With loads of throbbing modular synth pulsings, vintage Mellotron strings, choir and flute, and go for broke keyboard lead lines, Church offers ample muscle for the adventurous, archaic modulations for the experimentalist and dreamy floating space for the cloudwalker. The five pieces found on Church are examples of the Boddy and Shreeve live dynamic at its peak - fusing technological eras, living in the flow of the moment and simply playing their hearts out for their crowd. With this concert Boddy & Shreeve acheive so much; they take the audience from a grim parade in a desolate graveyard to the ethereal reaches of the cosmos - all in the space of one evening of creative ingenuity inside a church. 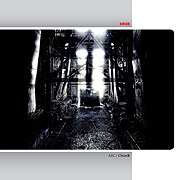 Church is a magical album, encompassing a variety of atmospheres and energy levels and demonstrates the rare thing that may be felt when unique talents, receptive audience and reverential mood all converge in a unique musical sanctuary setting.